Recently revealed US documents show that Western allies knew all along what really happened at Katyn, but chose to keep silent. In 1940, more than 4,000 Polish officers were secretly executed in the forests of Katyn, Russia, on the orders of a Soviet "troika court" authorized by Stalin's Politburo. Several thousand pages of documents related to the Katyn massacre have been published on the American National Archives website, unleashing interesting debates in both Poland and Russia. The published documents, which are a collection of materials from the U.S. State Department, CIA, FBI and several other government institutions, add little to our knowledge of the events from the Soviet side of the story. The main disclosures from the Soviet side - publication of the secret, March 1940 Politburo decision taken to execute the officers, documents related to the transport of the officers from Russian camps to Smolensk and to the place of execution - took place back in the 1990s, owing to the efforts of Russian historians. Now, American documents reveal the Western side of the story. "It is quite clear from these documents that, by the mid-1940s, Americans had full knowledge of the fact that the Katyn massacre had not been perpetrated by the Germans," professor Wojciech Materski said in an interview with the leading Polish liberal daily, Gazeta Wyborcza. Materski is an historian and leading authority on the events of the Katyn massacre. "But, for various political reasons, Americans did not come up with official accusations against the NKVD– they did not say that the execution was done by the Soviet secret police, even after 1945," said Materski. It is now understood that President Roosevelt had been informed of the matter through a special propaganda operation that was undertaken by the Germans. During their 1943 investigation of the newly discovered bodies, German propaganda services (which were headed by the infamous Dr. Goebbels) organized a visit to Katyn for an American prisoner of war, Colonel John Van Vliet. After the colonel was shown the site and supplied with evidence that the execution had been carried out by the Soviets, the Germans organized Van Vliet's return home to the United States. At home, Van Vliet prepared a report on the matter, which was conveniently "lost" several years later. Most likely, in the immediate aftermath of the war with Germany and Japan, Americans did not want to irritate their Soviet ally with these uncomfortable revelations. "It becomes apparent that the American authorities learned about what happened from their own citizens, back in 1943," reported Channel One of the Polish National Radio. "Russia, at the time, was bearing the brunt of the war, and the landing at Normandy was still one year away," the Polish station quoted Allen Paul, an American historian and the author of a best-selling book on the matter. "But in 1945 it was a different matter– I don’t think it could be justified." Official doubts as to the authenticity of the Soviet version of Katyn events were voiced in the United States only after a special investigative commission terminated its work in 1952-1953. 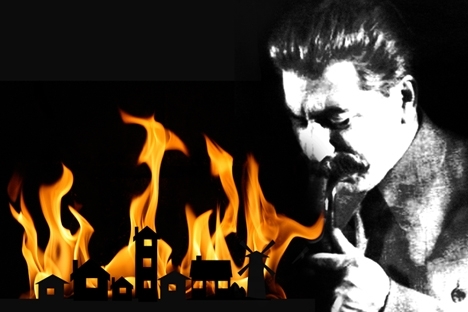 At the time, the United States had nothing to lose with Stalin's regime politically: the Cold War was in full swing and there was no point in sparing Stalin's feelings. However, Polish historians and Americans of Polish continue to bemoan the fact that American officials continued their talk of an "absence of total clarity" on the issue until April 1991, when Gorbachev officially blamed Stalin and Beria (Stalin’s NKVD secret police chief) for the massacre. Some "doubts" persisted until 1992, when the bulk of Katyn-related Soviet documents were published. In the Polish and American media, the story has most often been interpreted from a "beware of Russia" point of view, with stress put on President Roosevelt's "softness" towards the Soviet Union. However, it can also be viewed as one more display of the cruel pragmatism of the 1930s-1940s, typical of most countries at the time and not at all limited to the Soviet Union alone. It was this cynical pragmatism (almost all European countries cooperated with Hitler at some stage, Britain and the U.S. revealed and covered information depending on political conjecture) that ultimately led to the World War II. Attempts to view Katyn as some sort of ethnic vendetta, which allow current Polish and American authorities to take the "moral high ground" against the post-Soviet Russian regime (which found in itself the forces to reveal all the crimes on the Soviet side of the story) smack of hypocrisy. Now that we have a more-or-less full picture, it is becoming more obvious that the whole story of Katyn - on the Soviet, German and, now, American side - was a case study in cynicism and political opportunism from the beginning to end. "Stalin wanted to get rid of the Polish POWs, because he was wary of them becoming ‘the fifth column’ of a potential Franco-British attack against the Soviet Union in 1940," said Natalya Lebedeva, a leading Russian Academy of Sciences scholar who was one of the first researchers to "crack" the Katyn story back in 1990. Meanwhile, Hitler's henchman, Dr. Goebbels, wanted to use this story to drive a moral wedge between the Soviet Union and its Polish and American allies at the time. Apparently, American and British officials, with full knowledge of the story, first "believed" the Soviet version and, later, conveniently dropped it, when it stopped fitting their interests. When the Western allies suggested bringing the Katyn story to the Nuremberg trial as a "crime of German Nazism," Moscow declined the offer. When the commander of the German unit that (according to the Soviet version) committed the massacre was interrogated in 1941, it was evident that his unit was not even in Smolensk at the time of the executions. Nonetheless, the story was covered up - both by Stalin and his former Western allies. It would have to wait until the 1990s and 2000s to be exposed 100 percent - this time, in a modern public relations "war" with Russia. Besides the victims and the historians, there are no good guys in this story. Dmitry Babich is a columnist for Voice of Russia radio station.